Let's orient ourselves on the location of Temple XXI. In this photograph we are looking south. 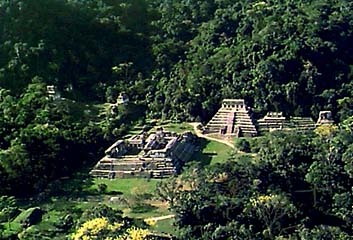 In the center and to the right is the characteristic shape of a great Maya pyramid, the famous Temple of the Inscriptions in which the tomb of Pakal the Great was discovered in 1952. The large mass of structures to its left is the Palace complex. Above the Palace and in the trees to the left is the Group of the Cross.